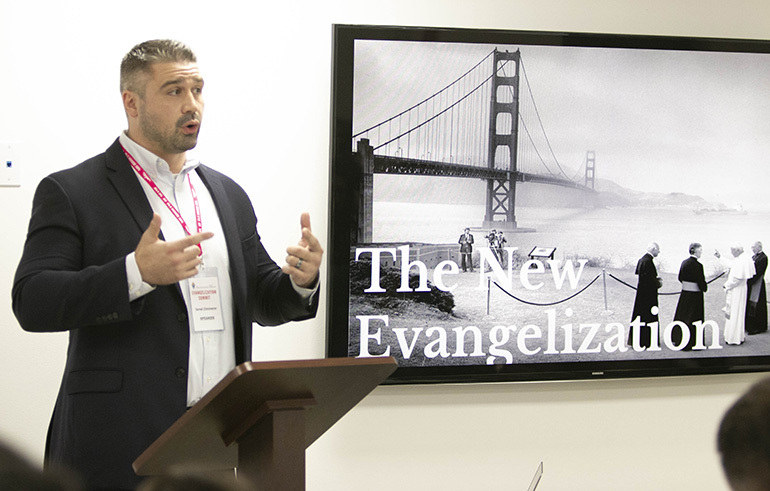 Jared Zimmerer, director of the Word on Fire Institute, was one of two keynote speakers at the archdiocesan Evangelization Summit, March 16, 2019, at Msgr. Edward Pace High School in Miami Gardens. 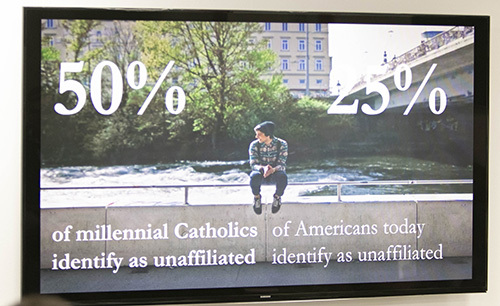 MIAMI GARDENS | Today’s statistics do not augur well for the future of the Catholic Church in the U.S.
Forty percent of people under 30 identify as “nones” — unaffiliated with any religion. That number stands at 50 percent for young people who were raised Catholic. Only 6 percent of Catholics — versus 75 percent of evangelical Protestants — consider it important to share their faith. 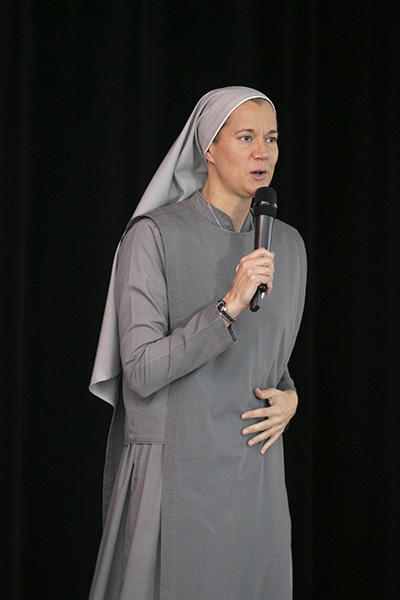 Sister Miriam James Heidland, of the Society of Our Lady of the Most Holy Trinity, was one of the keynote speakers at the archdiocesan Evangelization Summit, March 16, 2019, at Msgr. Edward Pace High School in Miami Gardens. But after citing those and similar statistics, speakers at the archdiocesan Evangelization Summit, including Archbishop Thomas Wenski, said a return to the evangelizing ways of the apostles could change that trajectory. That means focusing less on doctrine and more on relationships. He also noted that the most miraculous aspect of the apparition of Our Lady of Guadalupe is not the “tilma” where her image is imprinted, but the fact that within 10 years, three million of Mexico’s indigenous people had converted to Christianity. “The speed and the success of the evangelization of Mexico is unparalleled in the history of Christianity. The Mexicans embraced the faith because they felt embraced by Mary,” the archbishop said. The faith she showed them also was diametrically opposed to the one they practiced. While their faith called for them to sacrifice their children to the gods, in the Christian faith they found a God who sacrificed his son for them. 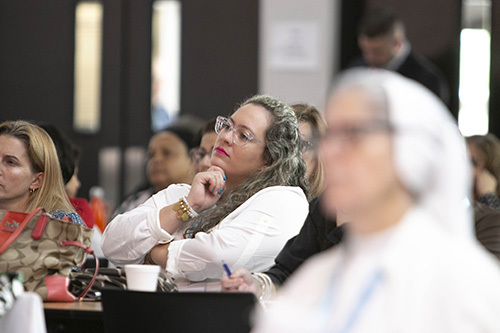 Participants listen to the keynote talk by Sister Miriam James Heidland of the Sisters of Our Lady of the Most Holy Trinity, during the archdiocesan Evangelization Summit, March 16, 2019, at Msgr. Edward Pace High School in Miami Gardens. Both keynote speakers at the summit stressed the importance of personal relationships as well. One of them was Jared Zimmerer, director of the Word on Fire Institute. The other was Sister Miriam James Heidland of the Society of Our Lady of the Most Holy Trinity. “It starts with belonging to a community, then believing what the Church teaches, then behaving” accordingly, said Zimmerer during a workshop that preceded his afternoon keynote. He noted that “we usually do it backwards,” expecting the behavior to precede belief and belonging to a community. He called on Catholics to, in the words of Pope Francis, “make a mess” of the cliquishness that happens in churches and connect with those who don’t go to church. Jared Zimmerer, director of the Word on Fire Institute, cited this statistic as proof that the Church needs to engage in a "new evangelization," with new methods and new tools. He was one of two keynote speakers at the archdiocesan Evangelization Summit, March 16, 2019, at Msgr. Edward Pace High School in Miami Gardens. Mary Ann Wiesinger, archdiocesan director of Evangelization and Parish Life, speaks to participants at the archdiocesan Evangelization Summit, March 16, 2019, at Msgr. Edward Pace High School in Miami Gardens. This was the third summit to be organized by the archdiocese in response to the recommendations made by the most recent synod, which ended in 2013. The other two summits focused on marriage and youth. 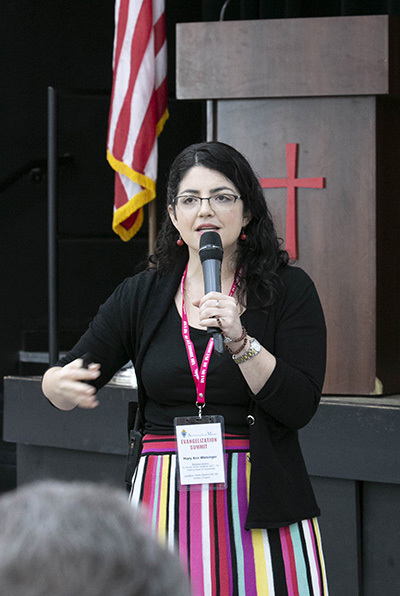 In addition to the keynotes, the summit featured eight workshops presented by representatives of local and national organizations, from Alpha for Catholics to St. Paul Street Evangelization. Those in attendance included archdiocesan catechists and school teachers, parish representatives, and young adults engaged in a two-year program of Missionary Discipleship. Participants are required to attend a retreat every month and eventually make a five-hour a week commitment to a parish ministry. In most cases, they minister to other young adults. “It’s super beautiful. It’s been absolutely amazing,” said Lantigua, a member of St. Mark Parish in Southwest Ranches. 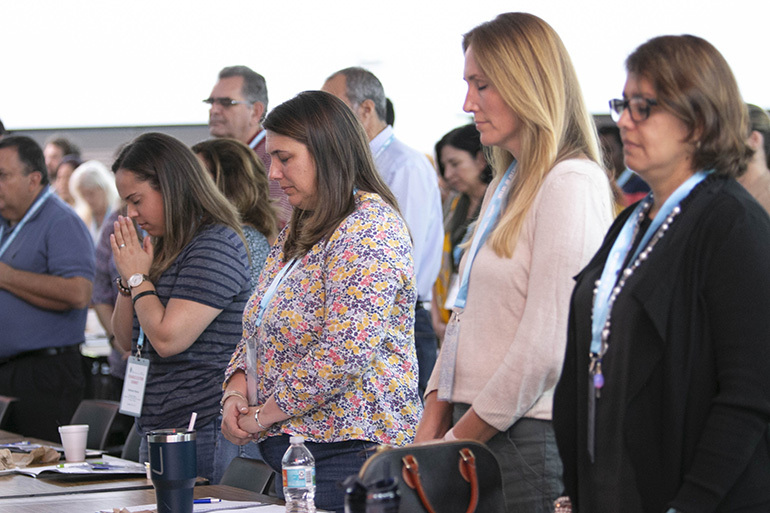 Participants pray at the start of the keynote talk by Sister Miriam James Heidland of the Sisters of Our Lady of the Most Holy Trinity, during the archdiocesan Evangelization Summit, March 16, 2019, at Msgr. Edward Pace High School in Miami Gardens.